The third of three core rulebooks for the 4th Edition Dungeons & Dragons Roleplaying Game. The Dungeons & Dragons Roleplaying Game has defined the medieval fantasy genre and the tabletop RPG industry for more than 30 years. In the D&D game, players create characters that band together to explore dungeons, slay monsters, and find treasure. The 4th Edition D&D rules offer the best possible play experience by presenting exciting character options, an elegant and robust rules system, and handy storytelling tools for the Dungeon Master. The Monster Manual presents more than 300 official Dungeons & Dragons Roleplaying Game monsters for all levels of play, from aboleth to zombie. Each monster is illustrated and comes with complete game statistics and tips for the Dungeon Master on how best to use the monster in D&D encounters. Core Rulebook: The Monster Manual is the third of three core rulebooks required to play the Dungeons & Dragons Roleplaying Game. Quick and easy play: The improved page layout and presentation enables novice and established players to learn and understand the new D&D rules quickly. 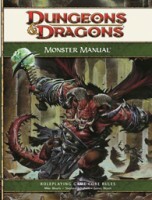 D&D Insider: The Monster Manual will receive enhanced online support at www.dndinsider.com. Publisher's Guide for their online tool "Character Builder"
The Monster Manual is easily the best part of the D&D 4e system. While attempting to avoid yet another criticism of the system, I will praise the concepts that make 4e a good miniature game, just not D&D. The Monster Manual turned monster design and roles on its ear. The concept of making Monster design roles independent from the character build system was brilliant. Monsters are not characters, they should not have the same rules. Making different rules for each monster based on its role was an awesome concept. A goblin scout has different rules than a Halfling rogue, even though they may have the same purpose in a party. A party of monsters can all be of the same race, but will have different abilities just as a PC party would have different abilites. Minion monsters make low threat cannon fodder useful in combat, while not draining many resources from party encounters. If left unchecked minions can be dangerous, but the only resource they really hurt is a party’s action economy. The simple monster roles make designing an encounter a breeze. Pick a handful of monsters with the correct CR (challenge rating) and you are ready to go. No longer do DM’s need to spend hours reconfiguring monster stats for templates or adding class levels to intelligent monsters, just pick the roles you want and get ready to roll initiative. Multiple rules changes and errata may have eroded the contents of the book itself, but the game design is solid. It’s hard to write a review for 4th edition without comparing it to the others, but I will do my best. Personally, this is not my favorite edition. 4th edition works incredibly well to teach new players the basics of DnD, but in my opinion WotC have really stifled the role playing aspect of the game. 4th edition is balanced very well, but in my eyes this is not exactly a “good” thing. For example, whether one is a wizard, a rogue, or a fighter, almost every ability reads “Do 1dx dmg to target creature.” Every class has essentially the exact same abilities, removing in many cases the need to work as a team and properly balance a group. 4th edition works very well as boardgame of sorts, but I personally feel that they are moving away from what made DnD popular in the first place. The number of monsters in this book is just astonishing. That is the biggest benefit of the stat block lay out. It is also really nice that all the monsters have an illustration. This is helpful for people with less of an imagination. I am also happy to see that there is not just an “orc” stat block. Instead, there are multiple types of orcs and other creatures. This makes doing an encounter with just one type of creature possible and not boring. The fact that monsters are not built up in the same way as Player characters is useful. It makes creating monsters on the fly take 30 seconds. It makes creating monsters take less than 2 hours of between game time (as in 3.5ed). The lack of story on all the monsters is a bit annoying. Yes, sure, it is nice to be creative and come up with your own story or description of some of those creatures, but sometimes it is nice to be lazy about it and have an explanation given to you. I mainly give the book a low components rating because the book is no longer current in any way. With all of the errata, every monster in the book has the wrong stats. The experience of most play groups was that monster defenses and hit points were too high, which was very true from my own play experience. It is nice that the designers agreed and made modifications. Unfortunately, it makes this book completely useless. With all that being said, I still actually really like this book. The stats are well laid out and jumping around in the book during encounters was a breeze. Unfortunately, it is outdated. If you don’t care about that or just wing changing the numbers yourself, it is fine. The 4ed Monster Manual makes it so much easier to run a game. you don’t have to work to create and balance your own enemies, and even if you do, it gives you a good selection of examples and templates to make the job go faster. There are the occasional hiccups, some creatures aren’t perfectly balanced, but I think that’s ok. As a GM you can tweak them to make them fit however you want. Add a Review for "Dungeons & Dragons (4ed): Monster Manual"